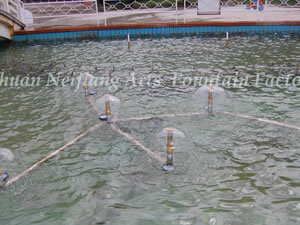 Guangzhou Water Art Fountain Irrigation Garden Co., Ltd is a professional manufacturer of creek water feature in China. In addition to creek water feature, we still provide customers worldwide with music fountain, programmed animated fountain, garden fountain, square fountain, scenic fountain, artificial fog fountain (mist fountain), laser fountain, sculpture fountain, floating fountain, running fountain, wall fountain, digital water curtain, indoor water fountain, outdoor water fountain, morning glory nozzle, flower fountain jet, dandelion fountain nozzle, rotary nozzle, adjustable nozzle, water sphere and hemisphere nozzle, aerated nozzle, spring nozzle, etc. We have built water features for Spring Festival Evening Gala of China, China Art Festival, and many other Chinese literature and art activities. And so far, we have set up long-term cooperation relationship with customers around the world, such as Malaysia, Brunei, Tajikistan, Saudi Arabia, UAE (United Arab Emirates), and many other countries in Central Asia and Southeast Asia. If you're interested in our creek water feature, please contact us freely. Wall FountainThe wall fountain can be used both indoors and outdoors, and it will be an essential artistic part for houses, offices, as well as tourist attractions. And it is quite helpful for the beauty of you surroundings, as well as relaxation.